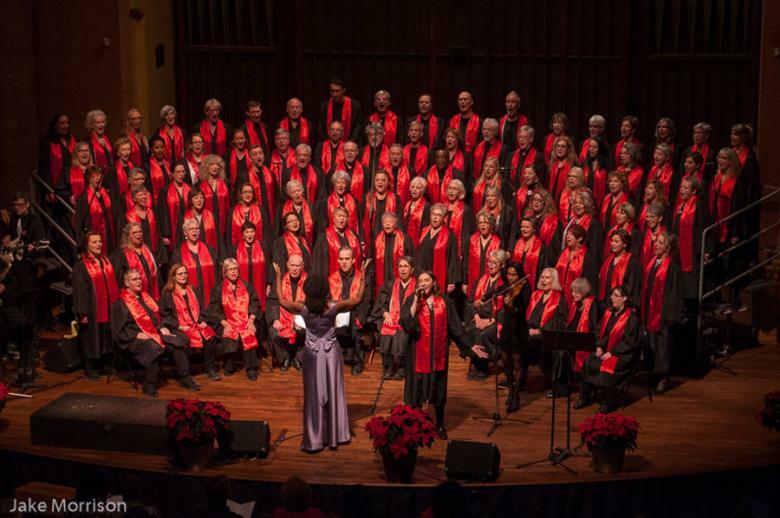 Big Soul Project (BSP) is Ottawa’s largest community choir, whose 130 members share songs of hope, love and peace to promote a sense of joy and empowerment. Our motto, “Lifting you Higher”, applies to both choir members and audiences who feel lifted spiritually and emotionally by our fresh, upbeat brand of choral music with roots in R&B, Gospel, Soul, Rock and Motown. BSP seeks to bring people together in song, to promote a sense of connection and empowerment within its membership, and to enliven communities through the gift of music. We are a dynamic group of individuals who come together to sing joyfully in a spirit of collaboration that engenders a sense of belonging. Our choir puts a fresh spin on gospel music, sharing songs of hope, love and peace while fostering a spirit of inclusiveness. Established in 1997 and under the dynamic leadership of Roxanne Goodman since 2008, BSP fuses the vocal energy of a large choir with the smooth sound of its talented house band, Deep Groove. BSP has quickly gained a reputation for its ability to entertain and inspire; our incredible on-stage energy and enthusiasm have audiences singing in their seats and dancing in the aisles. BSP opened for the Blind Boys of Alabama when they performed at Dominion-Chalmers United Church in 2004, and we performed at Bluesfest 2010 on the Gospel Stage with Lady Tramaine Hawkins. BSP has sung at many venues in the National Capital Region including the Rainbow Bistro and the Black Sheep Inn, and at festivals such as Westfest and Grass Roots. In 2012 we sang with Barbra Streisand during her Back to Brooklyn Tour and in 2013 we sang on Parliament Hill for the Christmas Lights ceremony. BSP has performed on CBC Radio as well as CTV and Rogers TV. On New Year's Eve 2016, a small group of BSP members participated in the Ottawa 2017 "Friendship of Fire" festivities at City Hall. BSP was especially honoured to have sung three times with Coco Love Alcorn in 2017, at a BSP fundraiser for Grammas to Ambuyas, at Coco's own concert at St Brigid's Centre for the Performing Arts, and at our Christmas concert in December. Every December we routinely sell out our acclaimed Christmas concert at Dominion-Chalmers Church. We also sing at a variety of fund-raisers and charitable events across Ottawa and Gatineau throughout the rest of the year. And every summer since 2015 we have given free public outdoor concerts at Lansdowne Park. If your organization is interested in booking BSP for your function, please refer to the Book a Gig page where you can learn about the process and start your application. 1997: Stephanie Coward of First United Church established the Ottawa Community Gospel Choir with a membership of six. 2001: With a membership of 60, the choir bid farewell to Stephanie. 2003: Michael MacDonald was hired as Music Director after two years of interim directors. 2004: Michael invited musicians to join the group. reflect our expanding musical goals and inspiration. 2006: Michael left Ottawa to pursue graduate studies following a CD release concert. 2007: Elise Letourneau hired as Music Director, replacing interim director Kim Kaskiw. 2008: Roxanne Goodman was welcomed as Music Director and continues in this role today.